Edelbrock Intake Manifold - Victor Series UNIVERSAL - MiataRoadster - Stay tuned with MiataRoadster! Cylinder Head Type Edelbrock 18 Deg. Cylinder Head Type Raised Port 23 Deg. Single-plane, high-rise intakes designed for maximum race-winning power at higher engine speeds. Edelbrock engineers work in conjunction with leading engine builders from all forms of competition to design manifolds compatible with the latest technology. 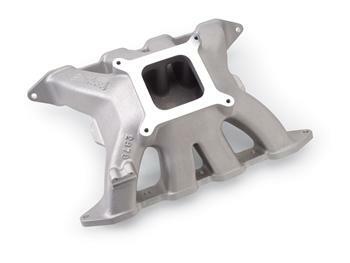 Victor manifolds are available for single or multiple carburetor set-ups. See individual listings for complete information.